Today, in a more serious mood, old Don Tano’s gonna tell you all about one of the most beautiful churches in all of Italy, not just Sicily alone, the church of the Immaculate Conception. Hey, before I came back home to Palermo, I’ve traveled all over most of the world, The USA, Mexico; Europe. But like that little girl sings in the movie: “There’s no place like home”…especially if “home” is in Palermo. Even if you’re not a religious person, you still have to be impressed by the church of the Immaculate Conception. This magnificent Baroque church anchors the very center of the Capo outdoor market in Palermo. Architect Orazio Lo Nobile designed this wonderful tribute to Mary, and construction had its beginning around 1604. I’ve seen some magnificent structures in my days but I have to put the Immacolata Concezione al Capo Church at the top of my list of the world’s most under-appreciated and overlooked outstanding constructions. 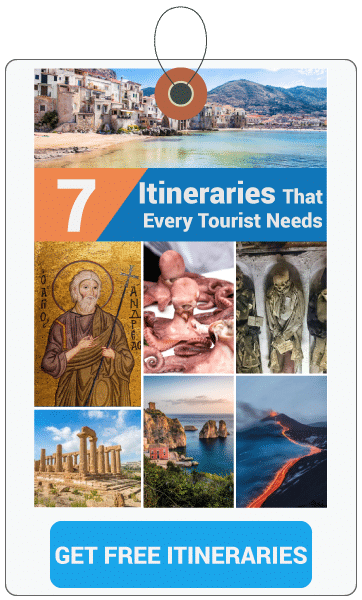 Still, here in Sicily, you might ask any Sicilian to name the top most important churches and he will tell you about the Cathedral, the Martorana, and San Giuseppe del Teatini. Well, he would be right…as far as he goes, but I believe that failing to include the Immacolata Concezione is in itself, a mortal sin. Some may think I’ve had far too much Marsala before breakfast, but to me at least, this church has more appeal than the cathedral. 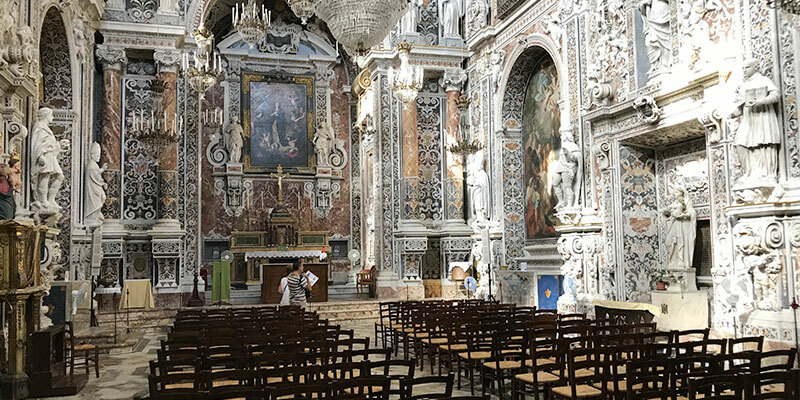 Just over half a mile from the Porta Carini, standing amidst fish and vegetable stalls at the center of the Capo open marketplace, this astonishing Sicilian Baroque style Immacolata Concezione church lies hidden from most passersby. After all, who would expect to find a church, even a dumpy little building, in the middle of a run-down, ancient open marketplace? The church is not only breathtakingly beautiful but once inside, as if in an enchanted garden, you no longer hear any noise from the outside chaos just steps away. And the Capo market is a very noisy place, I can assure you. Unimpressive and hidden among the stacks of fruit and vegetable crates, the entrance may fool the visitor. But once you step across the threshold it’s as if you’ve just passed St. Peter’s heavenly gate. The beauty of this church will absolutely stun and fascinate you as you gaze upon what at first appear to be frescos. Upon closer inspection, however, these scenes are in reality incredible marble pieces inlaid with precious stones. The church’s single nave has been decorated with polychrome and marble inlays. A golden filler of some sort makes the ceiling glow softly and stuns the eye with the fresco “Triumph of Religious Orders” by Olivio Sozzi. Many other Sicilian artists, over the years, have continued to enhance the church with other decorations. Among these were Pierto Novelli, Giacomo Amato, Giuseppe Velasco and Carl D’Aprile. Along the walls, to either side of the nave, you’ll look upon magnificent marble decorations that completely cover the remainder of the interior. The refined scenic effect realized by the genius of Sicilian artists who used hard stones, agate, lapis lazuli as well as colorful Venetian glass. But wait! Before you leave, you must look down at your feet and enjoy the praise-worthy floor. Its polychrome marble forms a unique as well as refined and colorful design that in itself, is a sight to behold. Visiting hours are Monday through Saturday from 9 am to 1:30 pm. Entry costs only 2€ and this same ticket permits you to receive discounts on other attractions such as the Cathedral and Monreale Duomo. 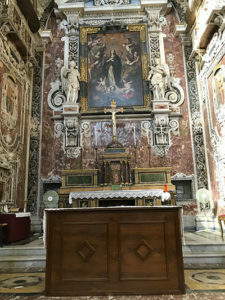 Rather than go on praising this sacred building, I think I should just tell you that when you get to Palermo, a visit to this church should be high on your list of beautiful sights to see. No matter what your religious beliefs, or lack thereof, I’m sure you’ll still have to be impressed by the beauty and dedication that has gone into this church’s construction. Besides, Capo open air market should be high on your list as well. If you haven’t seen a Palermo open market, you haven’t really seen Palermo! Until next time, old Don Tano says “Ciao”, and if you have any questions or comments, please use the comment box below. I’ll be sure to respond as quickly as I can. Grazie mille!